8z Art District Grand Opening! 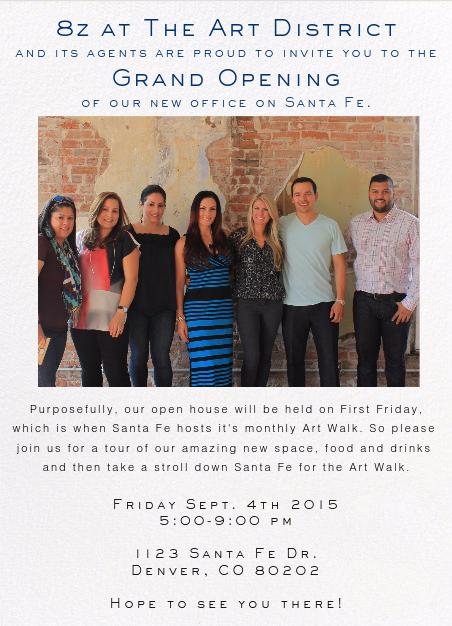 Come on out September 4th, 2015 from 5-9pm to celebrate the opening of the 8z Denver Art District new office! It’s first Friday, which is also the Santa Fe Art Walk. So please join us for a tour of our amazing new space, food and drink and then take a stroll down Santa Fe for the Art Walk.